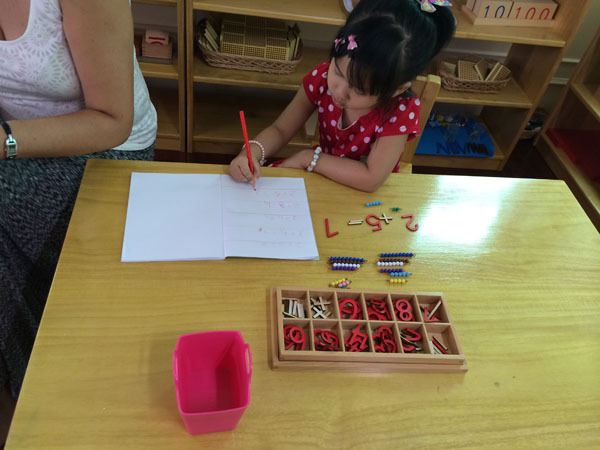 The curriculum is enriched through the activities and opportunities offered and it is delivered using Maria Montessori’s teaching method and will take into account the Early Years Foundation Stage themes and principles. The acquisition of skills and knowledge is planned carefully to excite and stimulate young minds. All skills through our lives have to be learnt from pouring our own drinks to tying our shoe laces. Whilst learning these skills and many more through the Practical Life exercises, your child will also develop and refine such skills as hand-eye coordination, directionality and dexterity in their hands, concentration and their cognitive development. 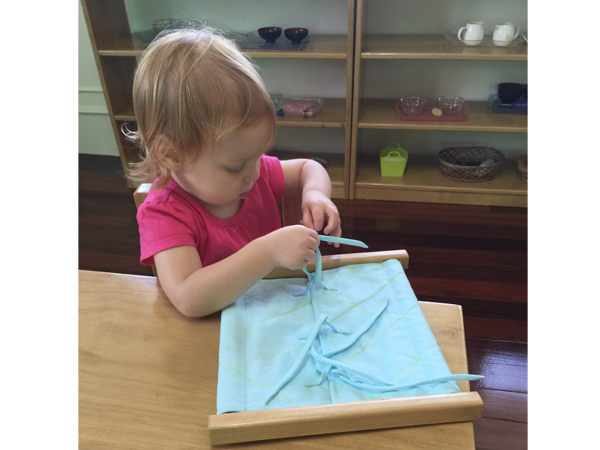 The Practical Life exercises also develop your child’s awareness, appreciation and concentration of their environment. They are shown how to care for and respect the environment, developing social skills and communication between their peers. The Sensorial equipment has been especially designed to assist your child in refining and organizing sensory perceptions. The materials develop the child’s patterns of logical thinking and through exploration your child will discover precise information and materials that reveal one concept at a time. 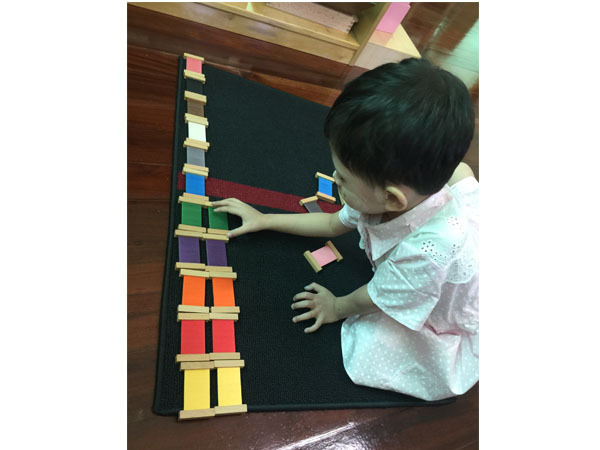 The Sensorial materials prepare your child to move through the Language and Mathematical exercises with the many skills required. After working with the Sensorial materials your child will be confident and ready to begin working with the Mathematical. With all the mathematical exercises your child will be introduced to the quantity of the number first and then number symbol. When your child is confident with both these concepts then the quantity and symbol are used together. The materials used allow the children to develop their skills gradually, building on knowledge they have already acquired. Once your child has developed skills of listening and communicating, enjoy stories and songs and has an interest in the printed word they will begin to work with the Language materials. This begins first by combining the sound and the visual appearance of the letter. The letters we use at this stage are made of sandpaper and your child will learn to trace them in the same way as if they were writing them. When they recognize the phonetic alphabet they will begin building three letter phonetic words this is followed in very gradual stages by reading. These include the traditional subjects of history, geography and biology. Montessori believed in a holistic approach to education, she wanted education to develop personality to help the child to adapt to his/her own culture and help the child become an independent, useful member of society. The children become aware of their own place in the universe, they study the sun and its importance, the solar system, animals and plants and the continents and more. Just as in the rest of the classroom where the children are encouraged to choose their own learning the art corner is set up in the same way. Activities such as cutting, collage work, painting of different kinds and sand and water play are available to the children at all times. Music sessions are held regularly with the children developing their knowledge of different instruments, their names and how to play them. 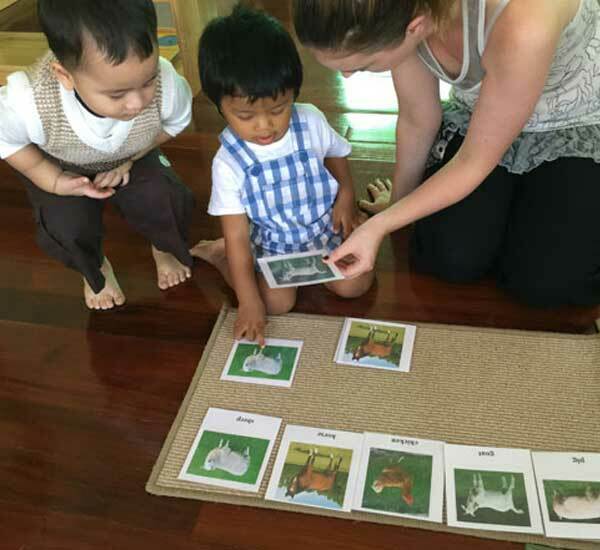 Burmese classes are held for children from the ages of three.